A medical student’s journey begins as soon as they enter the UMKC School of Medicine’s B.A./M.D. program. Immediate exposure to a curriculum that builds a strong foundation in medical science and clinical skills is integrated with the liberal arts and humanities into a year-round program. Our program allows students to choose an undergraduate major and earn their B.A. and M.D. in six years. During the first two years of the program, three-fourths of a student’s time is dedicated to the arts and sciences to fulfill baccalaureate degree requirements, while one-fourth is spent in medical school coursework. 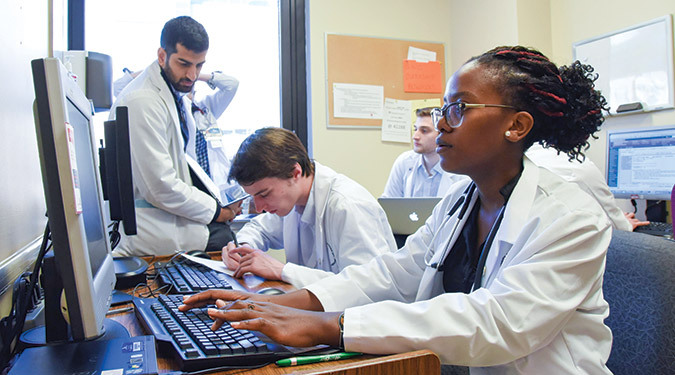 In the final four years of the program, the majority of the student’s time is spent in medical school coursework with a smaller percentage of time spent completing baccalaureate degree requirements. The ability to pursue certain undergraduate degree options is dependent on the college credit a student is able to transfer in from high school. College credit may be accepted for Advanced Placement, International Baccalaureate, CLEP or dual-enrollment courses. Students begin clinical experiences in the third week of the program through the docent system. A docent is a teaching physician who also serves as a mentor as a student advances through the curriculum. In years 1 – 2, students are assigned to docent teams of 10 – 15 students from their class. In this early docent experience, students are educated and mentored on the fundamentals of medicine. In years 3 – 6, students are assigned to docent teams of 12-15 year 3 – 6 students, a docent, a clinical pharmacologist, a clinical medical librarian, an education team coordinator and other health care professionals. In this docent experience, students spend a half day per week every week assisting with outpatient care in a continuing care clinic. This team also works together on the internal medicine rotation two months out of the year in years 4 – 6.